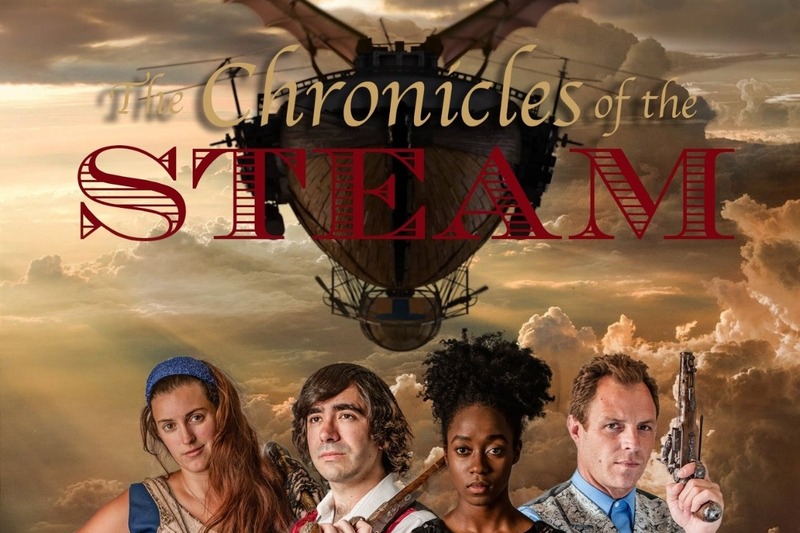 We are proud to bring you THE CHRONICLES OF THE STEAM, an ambitious new steampunk rock musical film following four people seeking an answer at the end of the world -- Anya, a young woman in search of answers after everyone she has ever loved has been taken from her; Jonas, a Saloon owner who feels the obligation to protect anyone who steps into his life; Finley, a brave man who seeks the truth of what has happened to the world; and Leona, a warrior who discovers her purpose to defend instead of fight. The film is a labor of love for the filmmakers. It is an attempt to create something not only visually stunning with breathtaking visuals but also with a memorable soundtrack that will wow the imagination and bring light to emotions that connect us all. All of this is coupled with a story that will boggle the mind and touch the heart. Interjected into the story are important messages about how modern-day humans treat each other and our fragile planet. The script is extremely tight with heartfelt characters, including the exciting and fun nature surrounding the steampunk-style universe. The film is something we all want to be proud of and we want you to join us. The filmmaking team is superheaded by award-winning filmmakers and artists. Writer/director/actor Everette Scott Ortiz superheads the creative team. Having completed work on his directorial debut THE ENDLESS FLIGHT, Ortiz is ready to take on the challenge of THE CHRONICLES OF THE STEAM. Ortiz will also join the cast with his extensive singing and acting talent having performed for the soundtrack of the feature film CAT AND THE TROLLS and appearing in several films including COYOTE COUNTY LOSER, THE PRICE OF THE AMERICAN DREAM II and most recently CHARIOT, alongside Anthony Montgomery (Star Trek: Enterprise) and 10 DAYS IN A MADHOUSE, with Christopher Lambert (Highlander) and Kelly Le Brock (Weird Science). Bruce Bray brings an incredibly versatile array of music to CHRONICLES soundtrack. Bray has worked extensively and exclusively with Independent filmmakers on both feature and short films, and web series. His present projects include “Age of Redemption”, a science fiction adventure film, “The Stadium”, a science fiction comedy, “Wonderland” a dark fantasy film by filmmaker Ciaran Davies. His past work includes the science fiction web series “The Index” and “Wendi”, a horror series by filmmaker Vaughan Grey. Director of Photography David Busse is one of the most sought after independent cinematographers in New Mexico. After making his cinematography debut in the feature film SPELLS in May of 2012, Busse jumped aboard THE ENDLESS FLIGHT and also served as the DoP. Since then his career has taken off. His work in the "New Mexico True" commercial series garnered him a state-wide award for Best Commercial. He recently helmed the music video "Arrichos Natch" for the group Double Dutch Oven. Visual effects supervisor Pawel Piotrowski is an award-winning visual effects producer and supervisor. Though THE ENDLESS FLIGHT was actually his first entourage into CGI (Computer Generated Images) in film, Piotrowski has been involved in the visual effects world for several years. His work on the short film EARTHBOUND garnered him the "Best Visual Effects" award for the 2013 Roswell International Sci-Fi Film Festival. He has also done recent work on the upcoming web series TAILED and the feature film CHARIOT. Piotrowski's experience will bring an incredible consortium of beautiful visual effects to the table for THE CHRONICLES OF THE STEAM. A film this ambitious takes an incredible amount of work, time and (of course) money. The film combines the past with the unforseen future from period Victorian costumes and flying machines to masks and Western ghost-town locations. This also includes the full-scale animation, storyboards and CG effects used to create the amazing environment in THE CHRONICLES OF THE STEAM. Everything is an asset. From paying our cast and our small but dedicated crew to creating this beautiful array of settings, everything boils down to one fact: we need your help. For just a very small amount, you can have your name in the end credits of our film and recieve a digital download of the soundtrack. For us, filmmaking is about collaboration and by putting your name in the end credits, you are part of this production and just as much an asset as anyone directly involved in bringing it to the screen. This movie becomes yours. We also encourage anyone who wants to contribute higher to please do so. Perks to be credited from associate to lead producers are also in the line up. Any bit helps to make this film to come to life and for you to be a part of it. Everything you contribute will be directly put to the screen. All of you are making this movie possible and we are eternally grateful for that. Thanks in advance for your incredible help!